In late March I attended one day of the National eXtension Conference (#nexconf) in Sacramento. I went to see Harold Jarche and Jane Hart speak but must say I enjoyed the whole thing. Jane was the keynote speaker for the day and they both ran a workshop afterwards. Since that day, I’ve been meaning to reflect on the event and revisit my live Tweet stream of the event. It’s been a while, but I’m finally writing that reflection. It was great to be able to see, and meet, some of the people I follow in the industry. I got to see a sight I thought I’d never see, but enjoyed. “Happy” by Pharrell was the song of the conference. The team running the conference put together a video of participants dancing to the music. It was fun seeing everyone dancing and having a good time, including Harold and Jane during a discussion panel. Jane Hart was up first, she talked about how she works in a social manner sharing information she learns with the public. There’s been a lot of talk lately about Twitter being in decline. I can say in the learning community it is as powerful of a source to learn as ever. No surprise Jane talked about Twitter being the number one learning tool this year. Twitter isn’t a source for training Jane says, it’s more about becoming better at what you do. This is a global economy and Twitter allows us to connect with others who do the same thing, get inspired, and learn. I take the learning one step further by branching out from just my industry into others. Inspiration comes from all corners of the world and diversity feeds my innovative side. Jane talked about the importance of social media and constant learning. Jane is right when she says before you pay off your student loans from a degree, the information you learned will be irrelevant. A degree only gives you the base level knowledge to work with. It’s a good beginning, but it can’t provide you the knowledge you need to gain throughout your career. It’s necessary to be a lifelong learner, not just conferences or webinars, but all the time. To maintain a learning attitude is the only way to stay relevant in your career and thrive. Jane talked a little bit about Harold’s framework, called Seek, Sense, Share. This is a way to manage the large amounts of information out there. Boiled down to its basics, you must seek information. Make sense of it picking the good from the bad and adding value. Finally, share the relevant and meaningful information while adding value. There will be a lot more to come of the Seek, Sense, Share framework, it’s the root of Harold’s PKMastery. According to Jane, a benefit of social learning is that job opportunities come in different forms, including student blogs. We should encourage students to reflect on their learning in the public. Not only does it help them better reflect, it connects them with others interested in their ideas. There’s also that side benefit of the interest companies may have in hiring them. Learning out loud – You have to always be learning. To reflect on that learning, it’s necessary to share it with other people. Working out loud – You need to show people what you’re working on. Go beyond collaboration into the realm of cooperation where inspiration and imagination become reality. As Jane Bozarth says, if you don’t think what you’re working on is worth sharing, then why are you doing it? First thought: show your work with the entire world!? But what I’m working on is proprietary and I can’t share it with anyone outside the company. There’s always something not proprietary you can share, it’s just a matter of seeing the value in it. Also, there’s the Enterprise Social Network (ESN) that you can share on. You can break down silos and connect with others who may specialize in parts of a project you’re working on. Between these two, there’s nothing that needs to be a secret. The benefits far outweigh any drawbacks of opening up your work to the world. [box icon=”https://www.technkl.com/wp-content/uploads/quote.png”]A Social Learning Practitioner is a learning professional who encourages, enables and supports knowledge sharing and collaboration across their organisation – not just in training. He/she is a role model, leading the way by showing the business what it is to be social, and modelling the new knowledge sharing and collaboration practices that are required for the modern business to operate effectively in the modern world. That was it for Jane Hart’s solo presentation but she is also an integral part of the workshop which came next. Harold Jarche had some great things to say in the workshop and great activities to get everyone’s blood flowing. Things got interesting. The conference was now about to be interactive, and in an eye opening way. Harold Jarche told the story of his t-shirt which a friend gave him represents how organizations operate today. Successful organizations in the 21st century are connected from the bottom to the top. Organization still operating in a hierarchy are a thing of the 20th century. If an organization isn’t going that way, they are going the way of the dinosaur. The question of learning styles came up from the audience. I’m not sure if it was to play devils advocate, or real, but Harold and Jane fumbled on who would answer that one. Harold took the reigns on answering. His answer was that there are about 6 billion learning styles. Everyone is unique, there’s no sense in trying to accommodate any single learning style. It’s not possible to accommodate every learning style. Harold introduced a 40 days course to what he is now referring to as PKMastery (rather than PKM). This seems to be a transition so people know it’s not the former broader field of Personal Knowledge Management anymore. It’s now a more unique Jarche brand Personal Knowledge Mastery. Harold recently hit his 10 year blog anniversary and took the opportunity to reflect on the past 10 years. He said that his first valuable thing he wrote took three years. I disagree that it takes any time to write something of value. It’s all valuable, and is all a learning experience. Of course he didn’t mean it but I felt the need to say it. If you’re writing a blog, its content is valuable. Maybe it’s not valuable to everyone, but it’s valuable as a personal reflection tool. Harold’s framework on learning and working in the network era has been an eight year work in progress. It represents the things we do in work and learning and how it all connects. Work and projects is where much of the knowledge we’ve gathered, learned, and reflected on comes to fruition. Communities of practice (CoP) is where we can test and discuss new ideas. These are usually formed around a specific topic of people who meet and discuss around that topic. Social sharing is a great source where inspiration comes from. You can get perspectives from various industries and gain diverse ideas. It is a great representation of how all the different networks come together to provide innovation and great ideas. This type of work-flow has provided me inspiration and allowed me to stay innovative in an evolving industry. Diversity is what creates greatness, you can’t get diversity if you get your information from a small scope of sources. It’s important to follow ideas and information from a diverse group of people. Other industries, different levels of expertise, different geographic locations, and any other diverse source. An interesting method of finding information on a topic you’re interested in was presented by Harold. Seek out a person that’s an expert in the topic and you now have a human filter. You’ll get information on that topic which has already been filtered and curated by an expert. Jane hosted a mini Twitter chat to show the diversity of information you can get from the Twitterverse. My idea on if I decide to follow someone back is simple: are they real? Regular tweets? Professional tweets with limited personal tweets? I feel that if I limit who I follow, I’m putting myself into a silo. My Twitter stream may be overwhelming, but the diversity far outweighs what I might miss in the river of information. Time to get the blood flowing. We all stood up for an activity orchestrated by Harold. He provided an eye opening experience of the accomplishments possible in a networked organization. Everyone in the room was instructed to stand up. Harold gave us simple instructions to pick two people in the room, but we couldn’t say who they were. We were then to organize ourselves as an equilateral triangle in relation to these two people. The problem is, we couldn’t talk and everybody has random people to move with, the crowd was in constant flux. Even with this complex formation, the entire room was able to do it within a minute and thirty seconds. The eye opener: Harold asked us to imagine the exercise with one person organizing the same pattern, it would have taken all day. Complex networks of people can self organize to create complex things without a hierarchy. There’s a fine line between sharing good information and spamming the world. Harold and Jane explained the importance and methods of how to create value for the information you’re sharing. By doing these things to the information you share, it will assist you in preventing over sharing. It takes a lot of effort to do this, and for good reason. If you share everything you see whether you read it or not, you’ll become the information spammer. I make a great deal of effort to read everything I share and make sure it contains quality information. The goal is to increase knowledge, gain insights, and get ideas to innovate. The goal is not to share as much as possible. It’s important to take your tacit knowledge, share it, and leave a knowledge artifact. It’s imperative that every point of Seek, Sense, Share is touched upon. If you only Seek and Sense, information may never become those innovative ideas. Likewise, if you only Seek and Share, you aren’t synthesizing the information to gain insight. 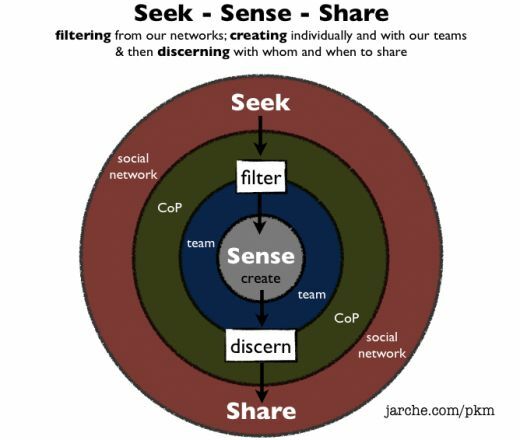 Jane and Harold shared the tools and workflows they use to practice Seek, Sense, Share. I find much of my information through either Twitter or Feedly. I then make sense of it at a later date in Pocket. Information I find beneficial or important gets shared via Twitter and LinkedIn. If a post is interesting and requires more value than Twitter or LinkedIn can allow, I may write a post to reflect better. 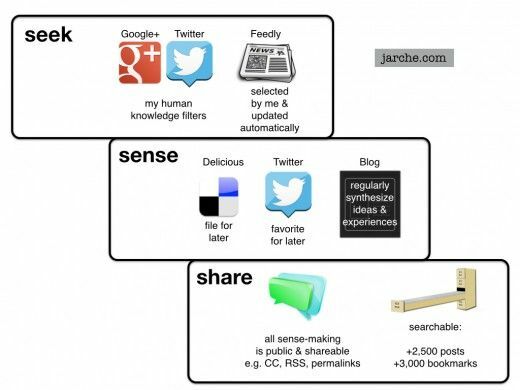 Even this post is part of the Seek, Sense, Share framework. While participating in the conference, I synthesized what I was hearing and seeing into my live Twitter stream. This post is a reflection on my Twitter synthesis. I have had three touch points from this conference. I started with a first hand experience at the conference. I then documented and immediately synthesized via Twitter. Finally, I am reflecting to write this post. This process has shared information with others and allowed me to benefit in the process. There were a lot of resources shared in this conference, either through Tweets or on screen. Many of them are from Harold and Jane’s web sites. This is a list of resources including my Tweet stream which I created a Storify of. Hope you enjoyed my reflection, and I’m glad it wasn’t a full day because then I believe I’d have a novel on my hands. I think you’re right that there’s more crossover than the chart suggests, but then again I think there’s some similar to that from Harold that also suggest more. There’s all sorts of overlap when working between work, social, CoP, etc. Things are more intertwined than ever and will continue to increase in that direction. Sort of reminds me of wirearchy again, everything is connected even outside of organizations now. ….and your comment reminds me of something Harold has said previously (paraphrasing hugely here): all models are flawed, some are more useful than others…they help us to make sense of what we’re seeing but they’re just tools – the complexity of social systems cannot ever be represented neatly in a single model or diagram (although we can try…!). The interactions within and outside of organisations (via people’s PLNs…) is also fascinating – it’s one way of bringing expertise and new ideas into the organisation. thanks Nick for the conversation! We sure can try, but then we’d dedicate our whole lives to that and even then it is something with a life of its own. It’s also changing as quickly as we can learn about it. I’m sure glad there are those that try to figure out though, and put names to parts of it.